^ McComb, D. M., T. C. Tricas, and S. M. Kajiura. (2009). “Enhanced visual fields in hammerhead sharks”. The Journal of experimental biology 212 (24): 4010-4018. doi:10.1242/​jeb.032615. ^ Chapman, DD; Shivji, MS; Louis, E; Sommer, J; Fletcher, H; Prodöhl, PA (2007-08-22). “Virgin birth in a hammerhead shark”. Biology Letters 3 (4): 425–7. doi:10.1098/rsbl.2007.0189. PMC: 2390672. PMID 17519185. https://www.ncbi.nlm.nih.gov/pmc/articles/PMC2390672/. ^ 仲谷一宏 (2016). サメ―海の王者たち―改訂版. ブックマン社. pp. 232-233. ^ Lim, Douglas D., et al. (2010). “Phylogeny of hammerhead sharks (Family Sphyrnidae) inferred from mitochondrial and nuclear genes”. Molecular phylogenetics and evolution 55 (2): 572-579. ^ Quattro, Joseph M., et al. (2013). “Sphyrna gilberti sp. 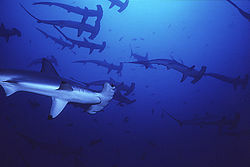 nov., a new hammerhead shark (Carcharhiniformes, Sphyrnidae) from the western Atlantic Ocean”. Zootaxa 3702 (2): 159-178.